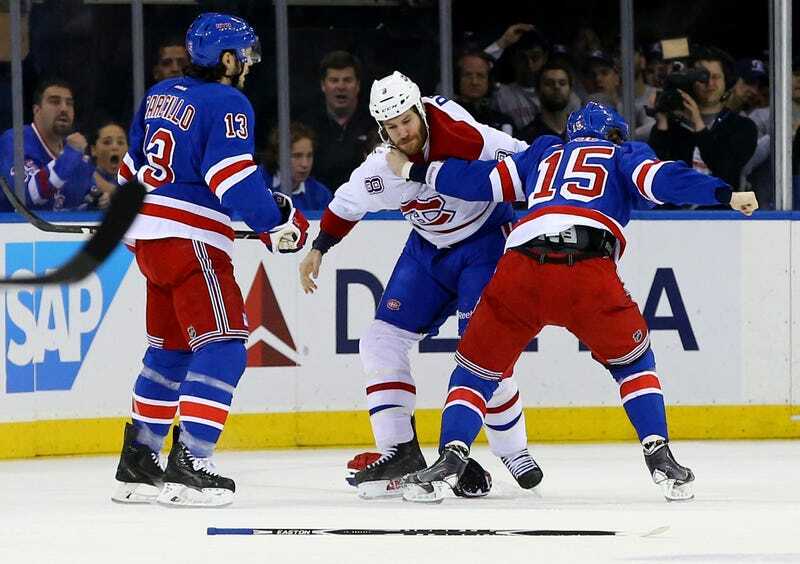 Which Hockey Leagues Have The Most Fights? The NHL has a lot more fights than, say, the NFL, but how does it stack up against other levels of hockey competition? To find out, Simon Garnier of Graph Zoo pulled data from the (hilariously '90s) site dropyourgloves.com and put together a neat graphic on "fights per game" across almost 100 active and inactive leagues worldwide. The full chart is below. The NHL falls in the middle—just to the right of the first "e" in "League"—but the real story here is the LHSPAA, a Quebec Senior AA Hockey League, which posts over five fights per game. The LHSPAA folded in 2006. According to a poster on the hockeyfights.com messageboard, to which we defer on all things hockey and fistic, it acted as a sort of brawling farm system for the famously brutal LNAH. That Quebecois league, along with two of its other feeders (LCH and LHSAM), managed around three fights per game, which either says something about how these numbers were collected, or says something about how hockey is played in Quebec. NCAA hockey—where fighting is treated like fighting in other sports is treated—has zero fights per game, as does CIS, Canada's collegiate league. Garnier was also kind enough to provide his full data and code, if you want to dig around a bit more.